Sandra Gomez-Aceves, a journalism student at Southern Connecticut State University, reported this story as part of Journalism Capstone coursework on World War I.
Hans L. Bilger was a Yale University student when he enlisted in World War I. Bilger never traveled overseas but was away from the university for five month. Bilger then returned and received a B.M. from the Yale School of Music. 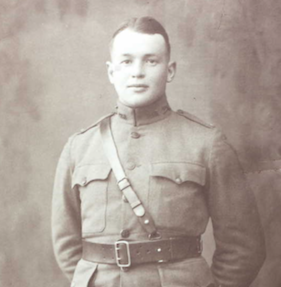 Hans L. Bigler, was a 21-year-old Yale University music student from Meriden when he enlisted to serve in the Great War. Bilger’s story isn’t unusual. According to an article by Yale News published in August 2014, nearly 9,500 students and alumni served in World War I.
Yale had the most Connecticut college students participate in the Great War, according to a Hartford Courant article published in March 1917. A month later, an article titled, “Connecticut Colleges Not Backward In Training Students For The War” highlighted the various training programs many colleges in the state offered. Yale, Wesleyan, UConn and Trinity all had training programs during the school year. Various captains from the Army visited campuses to go over drill procedures and prepare for a possible draft or enlistment. 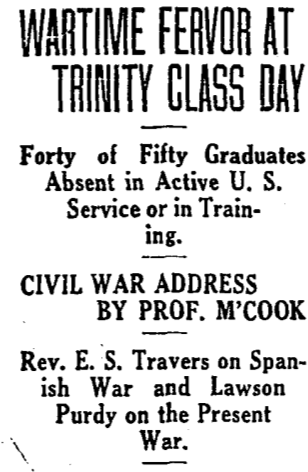 When the war started in 1914, Yale University was one of the first to have students enlist. The numerous training camps, and sense of patriotism in the state had something to do with it, said Judith Schiff, New Haven’s historian and Yale Library’s chief research archivist. Some of the programs were still held and students participated even throughout their March spring break. A Hartford Courant article published on Sunday, June 16, 1918. The article quoted William Grime, a resident of Cheshire and the vice president at Trinity College at the time. He spoke at the class day of the graduating classes accomplishments but said it was with greater pride to announce the classes largest accomplishment of having 40 Trinity men serve for the nation. While there isn’t an exact number on the amount of men who came back from the war and returned to college and received a degree, Schiff said that many men at the time didn’t exactly need them. Bilger, however, completed his studies. Bilger graduated with a bachelor’s in music composition. His published work can be found at Yale’s library. According to a Connecticut military questionnaire, Bilger described his experience serving in the Army as “good.” See a full timeline of Bilger’s involvement with the war here. Census records show Bilger married and later became a music teacher and musician in his hometown. He died when he was 72 and he is honored on the World War I honor rolls in Meriden and at Yale University.